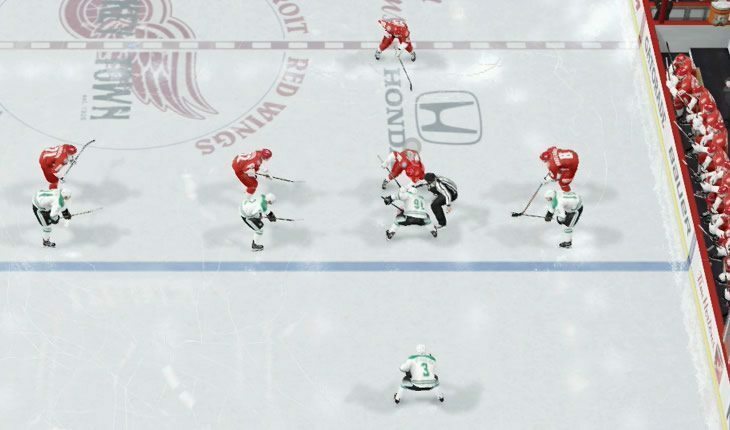 One of the most common questions you will see asked around the EA Sports NHL community is how to win faceoffs. It is not only about timing, even though that does play a big part of it, the NHL faceoff system has a lot of moving parts and we’ll dive into them below. I guarantee if you follow the tips in this guide you will win OVER 50% of your faceoffs in NHL 19. Depending on the team or player type you play with it could even be more like 60-70%+! 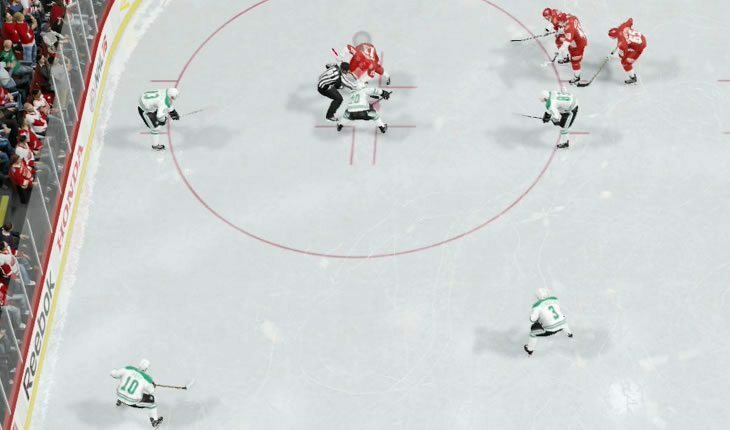 If you’re playing online, there will always be games where you have a bad connection and lose almost all of your faceoffs; but that is life when gaming online, unfortunately. Okay, so first we’ll cover the faceoff formations and then dive into the controls, counters, timing, and faceoff attribute. Feel free to jump to any section using the table of contents to the right. If you lose most of your faceoffs or are brand new to the game then I strongly recommend reading this all the way through. Disclaimer: I originally wrote this guide for NHL 17, but the faceoff controls have NOT changed for NHL 18 so all info still applies. Disclaimer:I originally wrote this guide for NHL 17, the only change in NHL 19 is the new faceoff counters, which I have updated below. You can change the faceoff formation by pressing B and then using LB to select the desired formation or if you’re on PS4 then use circle and L1. There are three types of faceoff formations: Normal, Defensive, and Aggressive. In addition, the formation can change depending whether you are in the offensive, defensive, or neutral zone. We’ll now cover the differences between each type of faceoff and the given zone that it is performed in. Your regular faceoff setup. Nothing special here. When to: I’m grouping both offensive and neutral zone because it’s an almost identical setup either way. “Normal” is your most balanced faceoff setup. In the offensive zone you can use it to get it back to your defensemen for a shot or to setup a play, be careful about the D to D pass. Almost all online players will be hoping you do it so they can intercept and get an easy breakaway. You can always pass down to the winger instead if you don’t have a shot. When to: Any time your opponent isn’t being super aggressive with shots off the faceoffs – in that situation aggressive faceoff is best which we’ll cover shortly. Very similar to the regular faceoff setup except the defense sit further back in the offensive zone. When to: Notice how far back your defensemen are above. If you win the faceoff then they will have a little more time and space to make a play. If your opponent wins the draw then they have plenty of time to back up and cover the neutral zone. 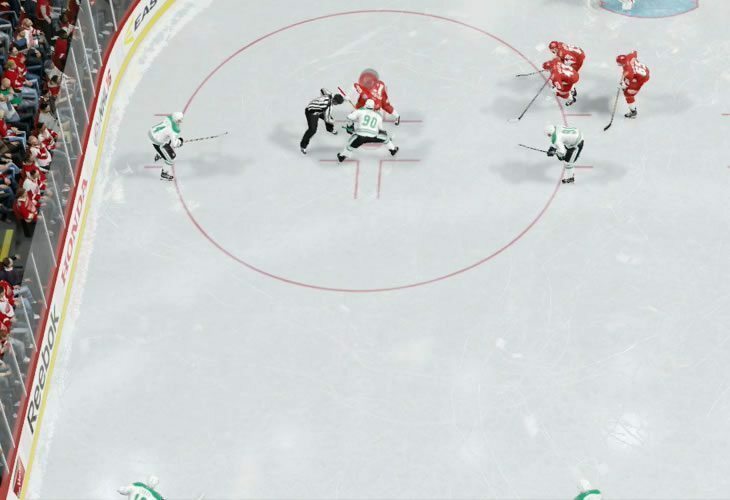 As far as NHL 19 goes so far, I don’t see much benefit in using Defensive faceoffs vs Normal. Do you use defensive faceoff strat? Let me know in the comments. 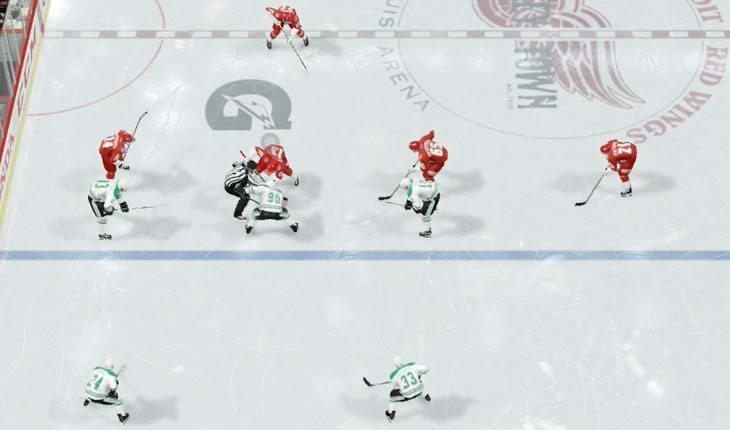 When to: Similar to the normal faceoff. Again, I don’t regularly use this and instead just stick to normal or aggressive. 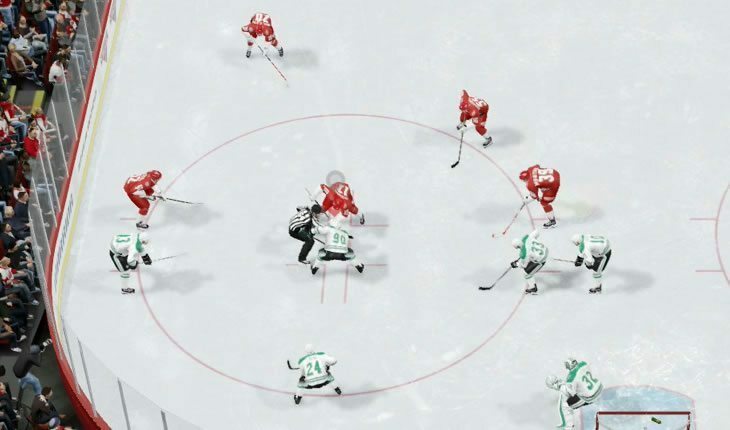 When to: If your opponent is using the aggressive faceoff strategy and going for that long pass to the wide winger then having a defensive faceoff setup will ensure they don’t get behind your defensemen. I still usually stick with normal in this situation as I find the D backup fast enough to avoid any danger. Now this setup has a couple more key differences over the first two. When to: Offensively, the aggressive faceoff setup is great for a quick shot. Of course, it depends on the handedness of the player so make sure you know your lines and what player you will have shooting. I prefer to have a lefty on the right dot faceoff or righty on the left dot faceoff. That way you can get the puck and immediately skate over to the slot to get a good shooting lane. Others prefer the opposite and try to go for that patented Ovechkin snipe off the draw(opens new tab). When to: While the aggressive faceoff is more meant for offense, it actually works very well defensively too if you are playing someone who frequently takes quick shots off the faceoff. Whether it’s from their defense or a forward in the aggressive position, you will have a wall of players setup in front of your net so it’s unlikely they will get a puck through. 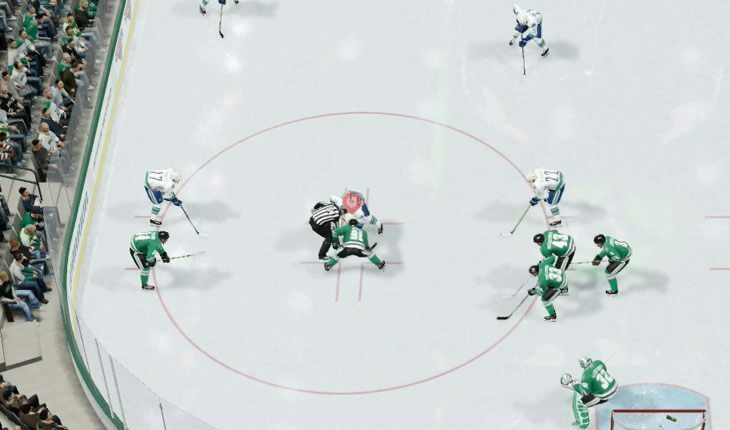 If you’re struggling defensively, don’t forget to check out the NHL 19 defense guide as well. When to: You can see the potential benefit in this case; win the faceoff and pass it over to the wide winger to race up the wing. 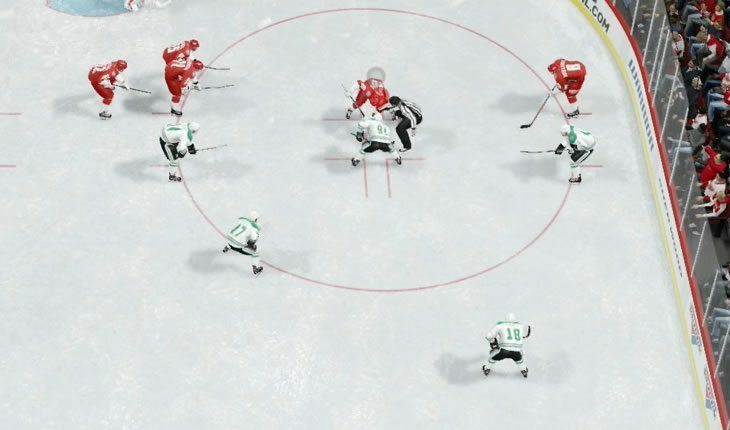 At the beginning of a faceoff you can choose whether you want to win it on the backhand or forehand by holding your stick in the respective position with the right analog stick. This is often referred to as choosing your grip and is very important, think of it as powering up your faceoff. The longer it’s held to one side, the more power your player has to win. Once you see the ref move then pull back on the right analog stick. Similar to forehand/backhand as far as choosing a side/grip and powering up except instead of pulling the right analog stick back – you will push it forward. Push up on the LEFT analog stick as the puck is dropped. You will still want to hold your stick to the forehand or backhand before puck drop even though you aren’t really using your stick. Do NOT hold your right analog stick to either side. Wait until the ref makes a move then just push it straight forward as if you were taking a snap shot. Use the left analog to aim where you want it to go. Keep in mind this is a very low percentage win. Similar to the shot, except hold down LB or L1 if you are on Playstation. So, don’t hold your stick to either side, wait for the ref to move then press forward on the right analog stick while holding LB(L1). Again, another low percentage success rate unless your opponent has no idea what they are doing. Win direction: If you’re winning the puck back then you likely have a player in mind you are wanting to win it to. Use the left analog stick to point in the direction where you want the puck to go. 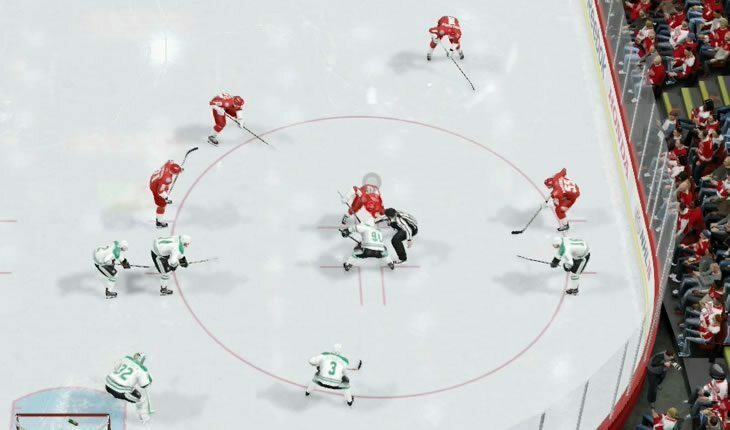 All of the faceoff controls/moves above have a counter so if your opponent is frequently doing the same thing and beating you then you need to change it up. Watch what your opponent does at the beginning, are they going backhand or forehand? Often players will get into the habit of doing a certain faceoff move in each zone so keep an eye on what they do. Once you learn their tendencies you will be able to win almost every faceoff. The above counters will work every time assuming all other variables are equal . Of course, we know very well that the other variables are almost never equal so taking advantage of counters is just another tool you have to increase your chances. Possibly the most important user controlled variable in faceoffs. You need to make sure you pull back or push forward on the right analog stick as soon as you see the ref move. Don’t watch the puck, watch the ref! Once you see him make the move to drop the puck then pull back or push forward depending which faceoff move you’re attempting. Due to the inconsistency of connections in online play this is made even more difficult. If you have a poor connection and know you have a bit of a delay then you will need to just guess when the ref will move and pull back a second or so prior to it. There isn’t a static amount of time for how long it takes the ref to drop the puck; it varies each faceoff but you will get a general idea of how long it takes so guessing isn’t impossible. I find with a poor connection that the tie up gives you your best chances, just hope your opponent doesn’t know how to counter it! If you’re doing everything above and STILL losing faceoffs then this is the problem. The faceoff attribute level of the player you are using is a major factor in whether you win or not. Find out what line your best faceoff men are and use that line in critical situations. If you do all the above then I guarantee you will be winning over 50% of your draws. Unless your connection is always terrible in, which case you have more frustrating problems to worry about anyway. Now that you are winning draws are you ready to start scoring off of them? Check out my Faceoff Goals Guide. Beyond helpful thank you for taking the time to make this!! It’s just timing. Hold backhand, soon as you see the ref move it should be a smooth (and quick) move to the forehand grip and down like you would a normal forehand face off. Once you get used to it it’s a smooth movement but the timing of when you move your thumb is a split second difference. So if you’re left handed: Hold backhand grip. Arm moves. Straight from right to left and roll down. Same here, not sure what red, blue or purple mean.